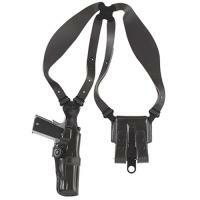 Galco Ambidextrous Vertical Shoulder Holster System (Black) FREE SHIPPING! The Ambidextrous Vertical Shoulder Holster System from Galco is a combat-proven weapon carrier intended for semi-automatic pistols and double-action revolvers, and tested on the battlefields of Iraq and Afghanistan. It fits easily over military or law enforcement uniforms for secure, accessible overt carry. Its modular design includes a harness, holster, ammunition carrier and system screws, and can be set up for a left or right-handed user. Its innovative spider harness system combines four independently pivoting points with a trademarked Flexalon swivel backplate, allowing it to move with you for an extremely comfortable and secure fit. Outstanding I have had a few other shoulder holsters but nothing compares. Excellent craftsmanship Exceeded all of my expectations Pricey but well worth the money. Shoulder Rig, everything you would expect from Galco. Service was exemplary. Don't change one bloody thing. Stay safe and Semper Vigilis to all you fighting the good fight. The comfort of the Galco Vertical Holster System is excellent. Drawing the pistol from the holster takes some getting used to, which was expected, is smooth and reholstering the pistols is just as smooth. The only downfall to the design is when it comes to my height and shoulder width. I am 6'3" with extra wide broad shoulders. I plan to purchase the quad mag horizontal lay pouch system. Also, I would like the option to have a tie down on the pistol. A snap on the muzzle end of holster allowing a leather strap tie down to be implimented would be quite ideal. I would reccomend this holster system to any law enforcment, military personnel and any concealed carry individual looking for that exquisite leather shoulder holster. Thank you for making such an excellent holster system. I would also like to thak you for being a true Made in America company. ©2002-2019 CopsPlus.com: Galco Ambidextrous Vertical Shoulder Holster System (Black) FREE SHIPPING!